The success of restaurant business is in delivering the quality services to its guests with impeccable taste. Our Food Restaurant apps Solutions let its clients focus on core food preparation, core restaurant business functions and serving activities through our impeccable suite of a range of restaurant apps. Research in the restaurant industry tells us that 60% of menu and review searches convert customers in a matter of minutes. Stats like these tell us how the popularity of restaurant apps is converting the industry. With future-proof solutions and high-visibility on online channels make sure that your restaurant business gets to remain ahead of the competition. With our cutting-edge tools and technology solutions, you can provide your customers great experiences. 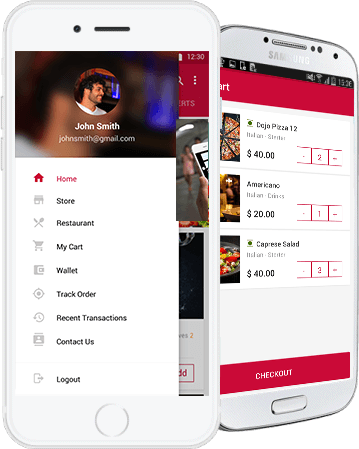 Customers can order food and beverages via your custom mobile app. The app showcases all menu items with descriptions, images, and prices. Maintain a comprehensive database of all your customers and target specific marketing campaigns via the app. Share reservation and event details such as themed events, food festivals, and such via push notifications. Your app will create automated invoices, allow online payment through secure gateways, and eliminate paperwork. The most important back-end requirement of all restaurants, inventory management makes sure that the kitchen is fully stocked. Understand your customer like never before with real-time data collation and analytics to get deep insights into your business in entirety. Integration with any third-party software like for accounts management, inventory etc. Every restaurant business is different and will have different requirements. We understand your requirements and develop apps based on the same, inculcating all important features into the app so that your business stands out in a crowd.